History is full of untold stories. And in British director Amma Asante's latest film, a little-known aspect of World War II is put under the spotlight. 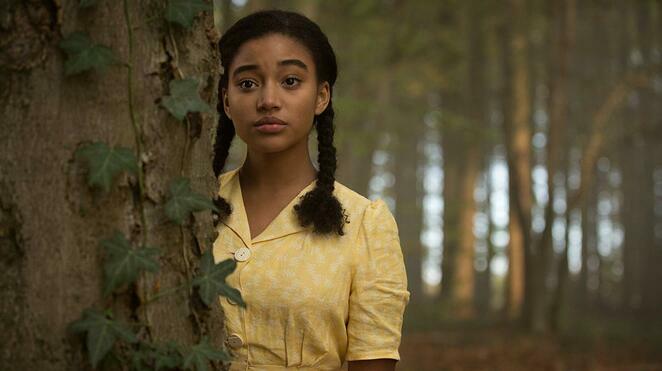 Where Hands Touch concerns the plight of Leyna (Amandla Stenburg), a biracial teenager living in Hitler's Germany in 1944. Leyna's mother is a white German and her father was an African French soldier. Her character is based on the thousands of biracial children who were living in Germany during World War II. As the film opens, Leyna's mother (Abbie Cornish) is fleeing the Rhineland with Leyna and her brother. They're headed for Berlin, where it's thought things might be safer. In Berlin, forged papers attesting that Leyna has been sterilised (necessary for her to avoid the death camps) are procured, and life, precarious as it is, goes on. Things become a lot more complicated after Leyna gains the attention of Lutz (George MacKay), the son of an SS officer and a young Nazi. Leyna tries to rebuff Lutz's advances - she's more concerned with her own survival: Jews and anyone deemed 'not pure' (a definition being expanded as the war goes on) are being removed from their homes. But the young couple fall hopelessly for each other. Leyna and Lutz sneak around together, and Leyna's mother warns her off. But it's too late. Their relationship will define their lives, even as the Nazis are defeated by the Allies. Attracting some concern prior to its release, Where Hands Touch was criticised due to its subject matter. The character of Lutz, and the whole idea of him falling in love with a biracial girl was seen by some as romanticising Nazis. This concern is unjustified: the many atrocities committed by the Nazis are amply related throughout the film. But the film isn't free of problems. Its pace is far too languid, the two hours hard going. Some plot contrivances too, especially towards the end of the film, are just laughable. What's missing is a plot that is entirely engrossing; what's here is just a soppy love story, despite the interesting background. There are flourishes. The cinematography is a major highlight aided by sets and costumes that immerse you in the period. And there's not much to fault with the acting, Amandla Stenburg does well with Leyna, as does George MacKay with Lutz. Abbie Cornish is perhaps the highlight, albeit with minimal screen time. There's a good, possibly even captivating film lurking somewhere in here, but the pieces just haven't been arranged properly.